Planner takes the user inputs and produces the reports by using five phases (P0 to P4). P0 captures country specific information. P1 captures service specific information. 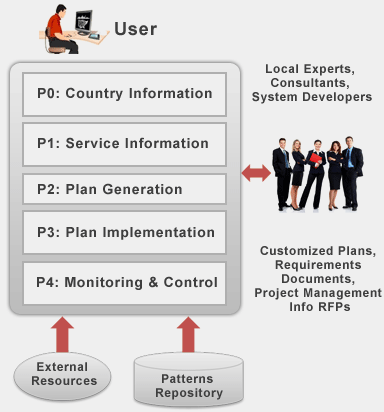 P2 generates a customized plan based on P0 and P1. P4 supports monitoring and control with heavy emphasis on project management and quality controls. At the end of these phases, the Planner produces extensive reports that contain a mixture: of generic and customized information.